It is fantastic to hear that you have been awarded 'D.Sc. Honoris Causa' by the TN MGR medical university. It is an extremely well deserved honour in recognition of your contribution to medicine and the huge volume of work that is being done. For me and to many many others, you have been a role model and an inspiration for what an individual can achieve if they set their mind to it irrespective of what the system gives or denies them. More importantly your work has shown that we can do this in a fashion that reaches the same system and in fact strengthens it . Congratulations from all of us at Seethapathy. Wishing you and the team with you the very best of health, energy and enthusiasm for more work and recognition in the future. 23 rd convocation of the Tamil Nadu Dr MGR Medical University was held on wednesday 29th February 2012 at 5 P.M at Centenaty Auditorium, University of Madras. Prof S.Suresh recieved the Life time Achievement Award from Hon Governor of Tamil Nadu Dr K.Rosiah and Hon Minister for Health ,Government of Tamil Nadu. We wish him many more such endeavours!!! 3. 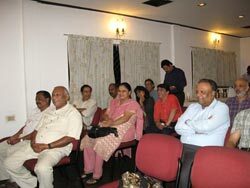 Dr. Sujatha Jagadesh to participate in the ICBDSR meet to be held on 28th September 2011. Dr. Sujatha Jagadeesh flies to Geneva representing "Birth Defects Registry of India" (BDRI) to participate in the "International Clearing house for Birth Defects Surveillance and Research" (ICBDSR) meet to be held on 28th September, 2011. ICBDSR meet to be held on September 28th, 2011. A poor couple from Tiruvallur was referred to MediScan with a Monochorionic triplet pregnancy with one acardiac acephalic baby. There was severe polyhydramnios and the risk of losing the normal babies if untreated was 100%. The option of in-utero therapy by occlusion of the blood vessel going to the abnormal baby was discussed and the parents were willing for the procedure. However, they could not afford the cost -Rs. 70,000. The patient was admitted at the Govt. 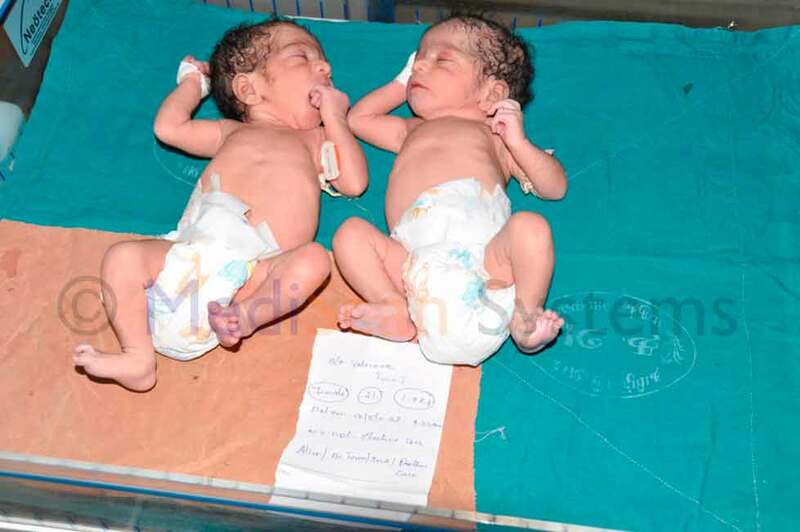 RSRM hospital under Dr.Hepsiba and the procedure was done at MediScan by Prof.S.Suresh, Dr.Indrani Suresh & Dr. Subapriya K . The pregnancy was closely monitored and the twin babies weighing 1.9 kg each were delivered by Dr.Hepsiba at Govt RSRM hospital, Chennai on 12/5/2011. 5. 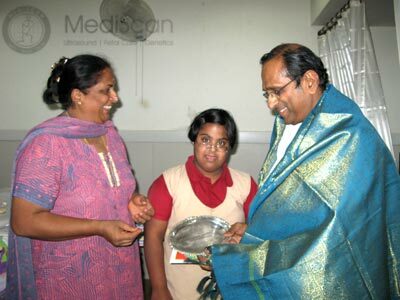 Prof. S. Suresh was awarded the "WORLD DOWN SYNDROME DAY AWARD" for 2011. 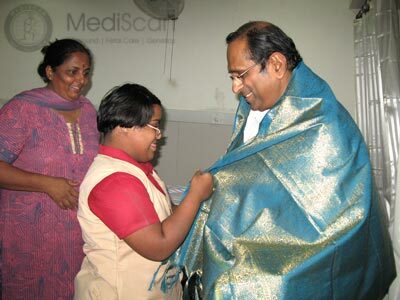 Downs syndrome international announced the 2011 World Down Syndrome Day Awards on 21st March 2011 and Prof. S. Suresh has been given the scientific award for outstanding contribution for the year 2011, as a medical professional in the field of Down syndrome. 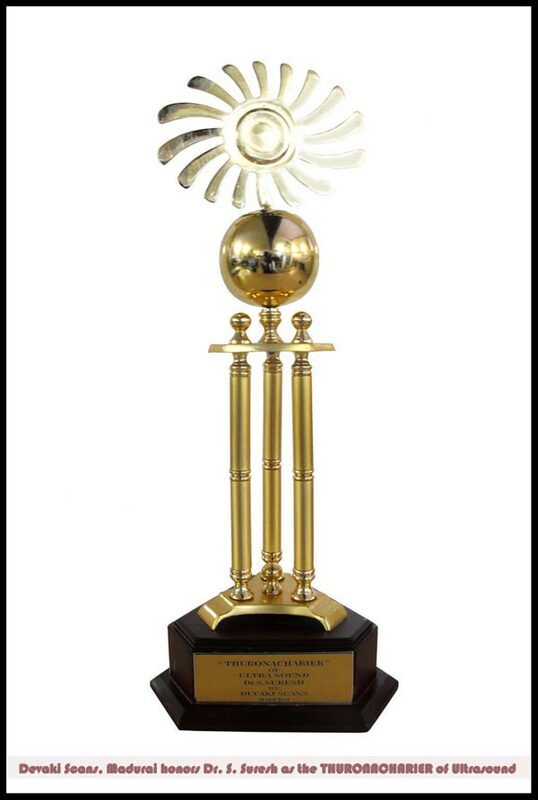 The award will be given at the 11th World Down Syndrome Congress to be held in South Africa on 15 - 17 August 2012. The 37th annual meeting of the International Clearing House for Birth Defects Surveilance and Research (ICBDSR) was held in Buenos Aires recently and BDRI's application for International membership was approved. BDRI will shortly be providing surveilance data and participating in ICBDSR projects. BDRI thanks all its members who have made this possible and for having supported this national cause so sincerely. Since BDRI is now an International Registry the effort would be to go all out in spreading the registry throughout the length and breadth of the country and more importantly improving the quality of data by supporting all anomalies with proper images and pictures. BDRI also wants to make an all out effort to move more and more towards online reporting. 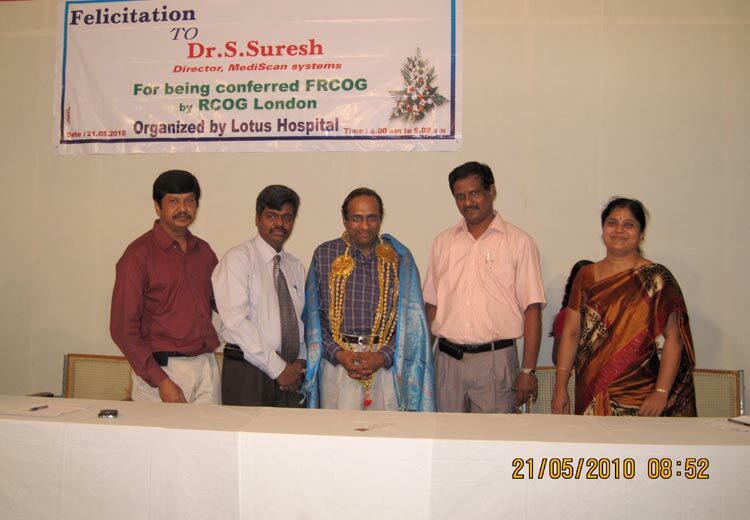 The OGSSI (Obstetric & Gynaecological Society of Southern India) society felicitates Prof. S. Suresh for his FRCOG by RCOG (Royal College of Obstetrics & Gynaecology) - London, UK on July 27th, 2010 in a meeting held by OGSSI at Institute of Obstetrics & Gynaecology Campus, Egmore, Chennai. 8. Prof. S. Suresh, Dr. Indrani Suresh and Dr. Uma Ram on "Understanding the unborn"
Technological advances have had a huge impact on our lives, especially in the medical field. And arguably one of the biggest beneficiary has been the pregnant woman. In times long past, the focus was on the mother: her health, what she ate, how she felt... With the advent of the ultrasound and other such advances, the focus shifted to the baby inside the uterus leading thereby to the rise of foetal medicine. One of the pioneers in the field of ultrasound and foetal medicine in India is Prof. S. Suresh, Director MediScan Systems, Chennai. He also played a key role in setting up a Birth Defects Registry of India, setting standards for Down's syndrome screening, introducing newborn metabolic screening and training of people in ultrasound from India and abroad. In recognition of his services in the field, he has been invited by the Royal College of Obstetricians and Gynaecologists, U.K., to be a Fellow Honoris Corsa and conferred the FRCOG in November 2010. Prof. S. Suresh (S.S.): The advent of ultrasound had a significant impact on how pregnancy was viewed. Earlier the only decision was when the baby could be delivered. Other problems were known only after birth. With the ultrasound, one started seeing things in-utero. In the initial stages, the idea was that the baby could be seen clearly only if it was big; so the first ultrasound was taken only in the third trimester. Today the first scan is done at 11-13 weeks. Serious problems are picked up early. Dr. Indrani Suresh (IS): Earlier, the focus was on the mother; the baby was felt through mother's stomach. Problems were always there but unsuspected. Birth defects couldn't be determined through a clinical examination. SS: The most common example: if the mother's abdomen was bigger than it should be, the assumption was a twin pregnancy. But it could have been a single foetus with hydrocephalus. Between two babies and hydrocephalus we wouldn't know clinically. Dr. Uma Ram (UR): Ultrasound improved our understanding of pregnancy. Machines improved and the times when we wanted scans also shifted; 10 years ago the ideal time for first scan was the fifth month... today it is between 11 and 13 weeks. Why we need to scan? SS: This scan has four objectives: to date pregnancy correctly, so that growth patterns can be identified; to pick up more than 50-60 per cent of structural abnormalities; the ability to screen for Down's syndrome; and lastly to identify multiple pregnancies. UR: There is a flip side too. Sometimes there are too many and unnecessary scans before 11 weeks. This could lead to missing out the crucial 11-13 week scan. SS: The question we need to answer is: why do scans at specific points of pregnancy? One is to confirm pregnancy and whether it is inside or outside uterus. For the high risk group, those who undergo IVF for example, everyone is anxious to know if sac has implanted properly. So the early pregnancy scan is required. But for a normal conception, the first scan may be done at 11-13 weeks unless there's bleeding , spotting or pain. UR: This is where couples' expectation comes in. They know that they can actually see the baby, so they ask if there's any harm... there isn't so long as they don't miss the main scan. IS: The ante natal card is very useful in such cases since details of the pregnancy are entered there ... Monthly check ups for mother: sugars, blood pressure etc. It should also contain times for foetal check up; you know, mark it with stars or colours so that patients will be alert. UR: That's very important because here in India they tend to travel from the in-law's house to the mother's house so at the first check up, we need to tell them this is the time for scan; to tell the doctor about any allergies or other health issues. SS: The second scan is only at 18-20 weeks or the fifth month. According to the old school, if you want just a single scan through your pregnancy this was it; the one that picked up over 90 per cent of problems. But it also creates a few problems. According to the law in our country, medical termination is allowed only till 20 weeks. If we find a problem at 18-20 weeks, we need to conduct further tests, which may take up to three weeks before the results are out. Supposing chromosomal abnormalities are picked up, the child will have lifelong problems. What if the parents can't cope? Where will they go? The National Obstetric Society (FOGSI) should lobby with the government to extend the law to allow medical termination up to 24 weeks... It is justified in the case of severe abnormalities that may not be picked up early. IS: Take the case of microcephaly, which means the brain does not develop properly. The baby will be born with strong lungs and heart and will live long but the brain will not develop at all. SS: (nods vehemently) This is diagnosed late because we wait for the head to grow. Suddenly at 24-26 weeks we realise what the problem is. I strongly feel that if the government will not allow terminate a pregnancy beyond a certain point, it is the government's responsibility to take care of the child and must provide the necessary supportive care for the rest of its life. Where is the support structure for management of anomalies? There are no designated specialised centres to take care of birth defects… parents run from pillar to post. Of course, there are parents who terminate pregnancies even for minor abnormalities like club foot. This is easily correctible but even after extensive counselling they will insist on termination. This is because of high anxiety levels. UR: It is also due to a very low threshold of acceptance for even minor deviance from normal; the expectation is of a "perfect" child. SS: Often the couple is pushed into a decision that may not be theirs due to pressure from family and relatives. IS: In one case when we diagnosed a heart defect, we counselled the parents that it was treatable. After three months the mother said she had terminated the pregnancy. "Who will take care of the baby?" they asked. We do not have streamlined support systems for such people. SS: Terminology matters a lot. We now use the term 'normal variant'. SS: Well, you have two reasons for this: exponential growth of ultrasound centres and no concomitant growth in training. There is no official training programme in ultrasound but what we need is a special diploma in obstetric ultrasound. Ultrasound should be declared as a sub specialty. The training in ultrasound during one's PG course is inadequate. Also, technology is ever changing. A person who did MD Radiology 15 years ago needs re-training to handle today's machines. We need to adapt, keep ourselves updated. The mindset has to change. Online certification is available for each and every aspect of foetal care, so is practical training … We need to think about the patient. All they want is an answer and till they get one, they will keep running around… What we need is training, quality and certification. UR: The Foetal Care Research Centre has from the beginning focussed on training. You are a private organisation doing active patient care. So how has this insistence on training impacted your workflow? IS: (laughing) If we hadn't started training, we'd have heavier pockets... our technologists and doctors would be richer too. SS: It's kept us on our toes; we have had to stay aware of development in the field. Second, the people trained by us automatically become referral centres for us when they go out into practice. We've had people from Aurangabad, Mumbai... all over India... and when they train others to the same standard, we are automatically reaching a larger number of people. IS: Our objective is to train individuals who will then go out to give the same standard of care and training to others. SS: The Foetal Medicine Foundation in U.K. is a pioneer in foetal care. They have standardised the 11-13 weeks scan and give an online certification. Doctors can take the online course and submit images of scans. These are reviewed critically with feedback on how to improve. We are the first foetal medicine centre in Asia to be recognised by the foundation. Those who go through the online course come here for practical training and send the images to us. This has helped us promote standardisation; spread concept of Down's syndrome screening. Of course with online lectures and demonstrations, I can reach so many, right from my desk here. SS: In a rural set up, we are in the process of taking it to the last mile. Neural tube defects are the most common but by taking one picture of the head, 98 per cent of open neural tube defects can be identified. And then there are the big five anomalies; we have trained a significant number of doctors in rural areas to recognise these. We'll achieve quite a lot even if they spot two or three of the big five. At least we would have made a beginning. But there is no point in having the best service in Chennai or Mumbai or Delhi... we need to get this knowledge to the deepest corners. We want to work with the government on this. The idea is to interest the doctor at the periphery to use the machine and spend time on each patient; not look upon it as another job. The availability of machines is not an issue; every PHC has at least a basic machine. UR: The machine is only one aspect; unless you know what to see you won't see it; training is crucial. Of course the availability of doctors and nurses at PHCs is a huge issue but, on the whole, healthcare delivery in Tamil Nadu is much better than the rest of India. SS: We also need to look into the issue of pay. Most doctors especially obstetricians-gynaecologists cannot plan their lives. They have to drop everything and run when patients call. You need to pay them well; just calling medicine a noble profession is not enough. 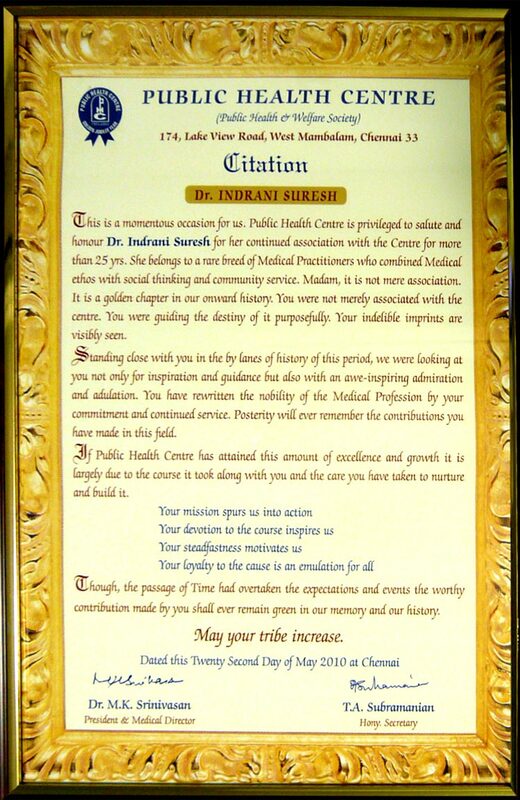 Public Health Centre on its golden jubilee year on 22nd May 2010 saluted and honoured Dr. Indrani Suresh for her continued association with the centre for more than 25 yrs. The citation said that Dr. Indrani Suresh belonged to a rare breed of medical practitioners who combined medical ethos with social thinking and community service. 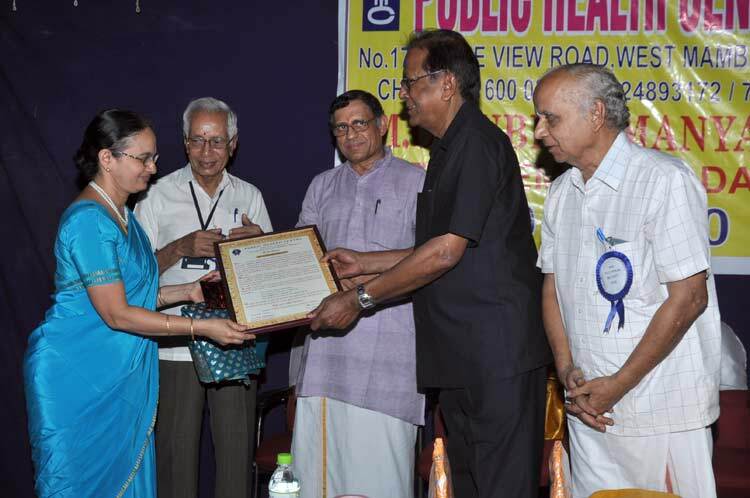 Dr. Indrani Suresh said she was proud to have been associated with the Public Health Centre for more than 25 yrs and called the founder of Public Health Centre Dr. M. C. Subramaniam a true Gandhian whom any professional should emulate. 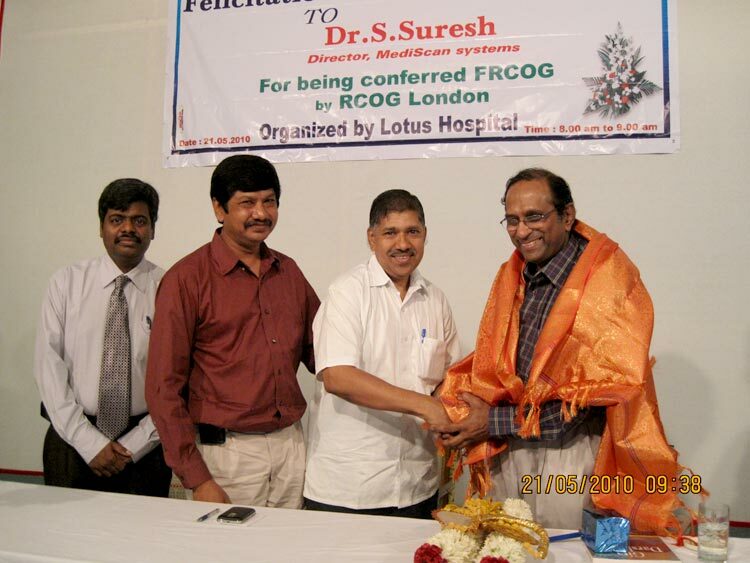 In a meeting organized by Lotus Hospital, Erode on 21st May Prof. S. Suresh was felicitated by the managing director District governor (Rotary District 3202) Dr E K Sagadhevan, Dr. E. S. Usha, Dr. S. Eswaramoorthy and Dr. R. Selvan. 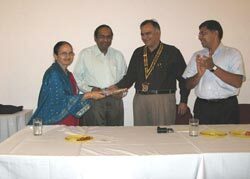 The Tamilnadu IMA President Dr. S. Sukumar adorned a shawl and felicitated Prof. S. Suresh. 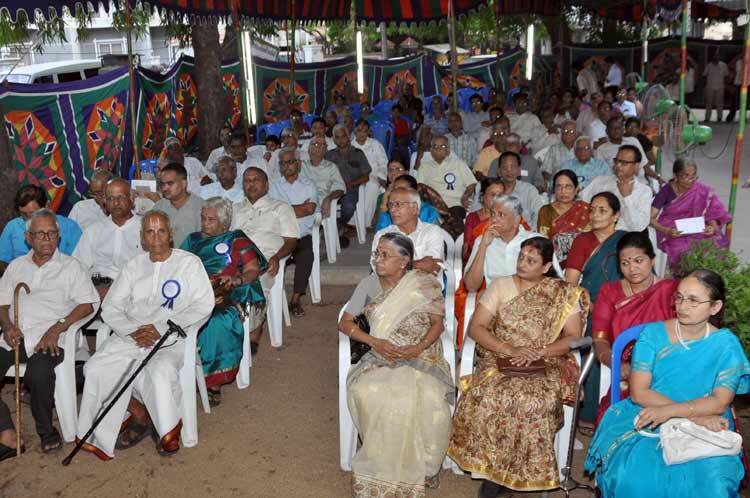 Erode IMA President Dr. Madhavan and EOGS President Dr. Hemalatha Arthur also felicitated him. 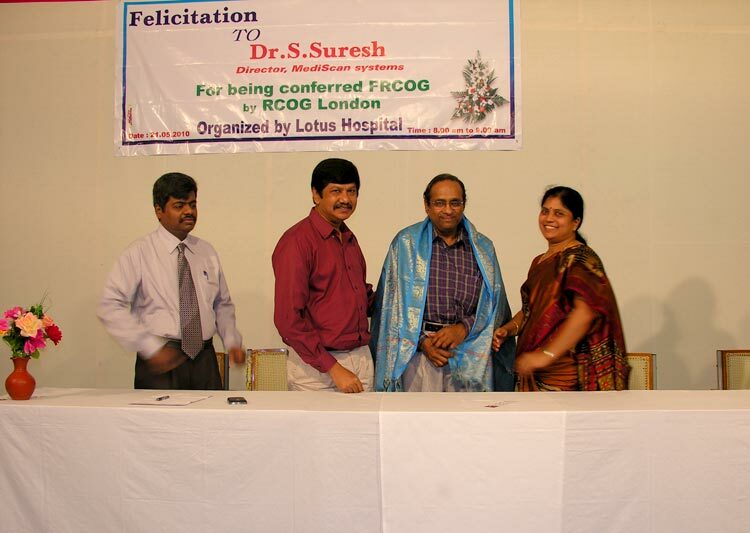 Devaki scans, Madurai honors Prof. S. Suresh of MediScan as "Thuronocharier of Ultrasound". The Rotary Club of Madras felicitates Prof. S. Suresh of MediScan for being conferred FRCOG by Royal College of Obstetricians & Gynaecologists. 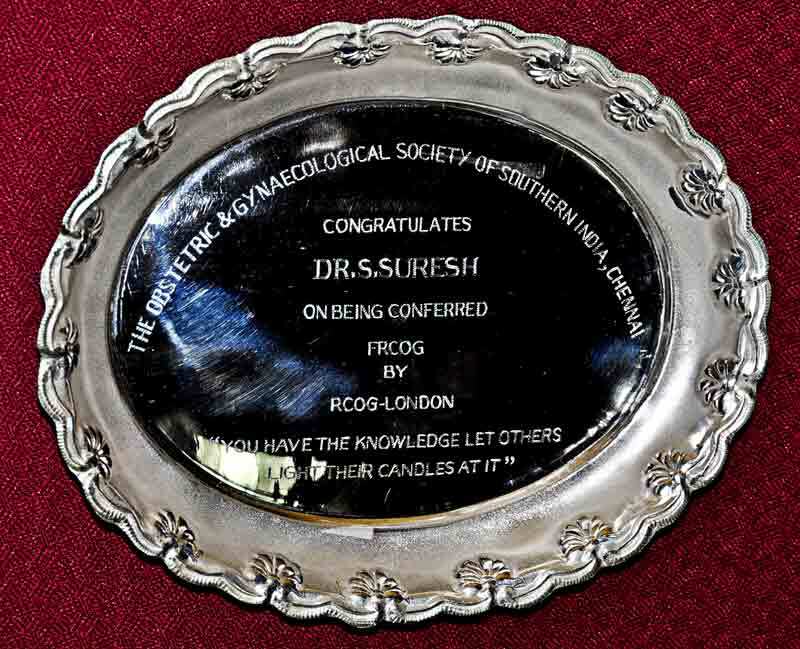 The Royal college of Obstetricians & Gynaecologists has invited Chennai-based Prof. S. Suresh, Director, MediScan Systems, to be its Fellow Honoris Causa. The award will be conferred at a function in November. This award is being given to him to acknowledge the highest level of dedication & achievement in clinical care and support to the development of women's healthcare services. The appreciation is for his pioneering work in the field of ultrasound and foetal medicine.